Please note that the playwright, Bo Wilson, will now be attending the Saturday, February 18th performance. It was initially advertised that he would attend Friday, February 16th performance. We apologize for any inconvenience. If you would like to switch your tickets, please email info@waterworksplayers.org or call 434-392-3452. The Charitable Sisterhood of the Second Victory Church, the Waterworks Players’ upcoming production, is in many ways a home-grown affair. Playwright Bo Wilson, the author of more than 40 plays, is a Richmond native. 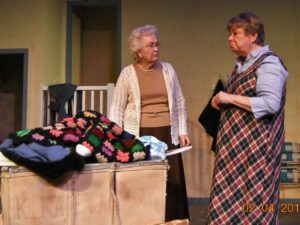 The Charitable Sisterhood is set “just outside Pennington Gap, Virginia.” And among the all-woman ensemble cast are longtime Waterworks veterans Martha Womack and Daphne Mason. “Yeah, all those lines—for everyone,” Womack echoed. “We hit the stage and we just keep going. One good thing: there are no costume changes. But we have lots of props, and they have to be strategically placed in that “bazaar pile” to mesh with our lines.” “Poor Dudley has had to work hard with logistics—both props and people,” Mason laughed, just as director Dudley Sauve showed up to usher them into rehearsal. “They’re doing a d—ed good job,” he said. The Charitable Sisterhood of the Second Victory Church runs February 9th, 10th, 16th and 17th at 8 p.m. For ticket information, go to the Waterworks website, www.waterworksplayers.org/buytickets, or call 392-3452.